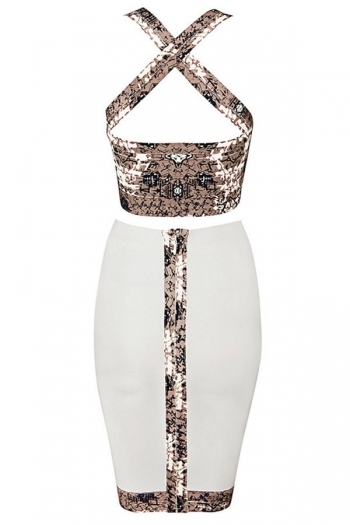 Everyone loves our cute White and Taupe Printed Bandage Two Piece Skirt Set. Look super flattering wearing this two-piece. It comes with a zip up cropped vest top and an angled asymmetric design on the skirt, topped off with an on-trend graphic print. Bandage dresses here always made with love and luxe bandage fabric. Pair this cute number with white heels for a stunning party look! It's always easy to shop for White and Taupe Printed Bandage Two Piece Skirt Set at Girlmerry.com ,from china wholesaler. Always quality, always affordable at worldwide.